It’s a personal story. 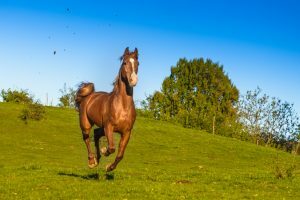 I’ve promised to explain what drags me towards horses a nd why I’ve made, at almost 40, the radical change from business journalism to equine photography. It’s difficult to write about myself after two decades of writing about others. 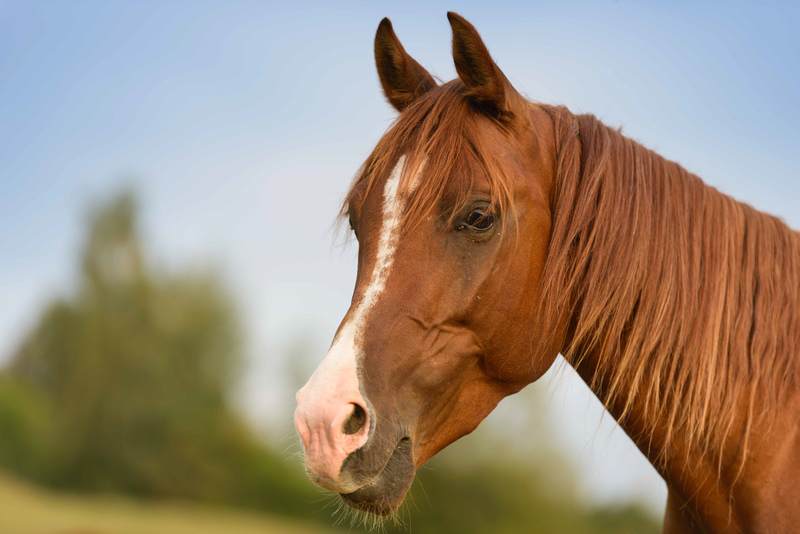 It is all connected, one way or another, to Petru, a six-year Arabian horse. He’s the horse of my soul. He’s the horse who helped me find my way during a troubled period of my life. 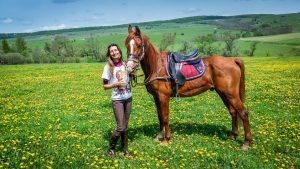 “I found the horse that fits you,” Dan Mosescu, the owner of 7Cai (7Horses) equestrian center, in central Romania, told me two years ago. I knew he was a fine psychologist, in spite of his armor of tough man, but I didn’t believe him in the beginning. Petru was quite bad-tempered. He was hopping all the time, was agitated and would run very fast without notice. He was spectacular, that’s true, but I was completed terrified at the thought of riding him. I am a good rider, but not so good. Petru was far too dangerous for my powers. I ha d been thinking about quitting journalism for several years. I had won sufficient prizes and had a well-known brand in our mass-media, but I felt I no longer fitted the system. Slowly, I started to look around. I took photography courses for two years. In the end I knew how to use a photo camera correctly, but that wasn’t enough for me. I specialized in photo processing, to be able to do almost everything I wanted with a photo. That was still not enough for me. I wanted to be able to take artistic, stylish, exclusive photos. So I attended a tree-day workshop held in Europe by one of the world’s most renowned wedding photographers, Jerry Ghionis. I learned from him how to play with light. How to create spectacular images out of ordinary photographic situations. How to emphasize feelings and manipulate emotions. How to notice details that make the difference between a common image and an emotional one. 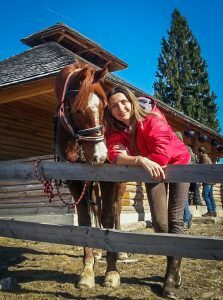 At 37, I gave up the profession I had specialized in up to the level of MBA and ventured out of my comfort zone, into a “blue ocean” area in Romania. The artistic photography. Nothing went as expected. Two years of struggle followed. Artistic “trash the dress” photos with brides and grooms. Artistic business images to emphasize the investments companies made. Zero success. I was a talented photographer, over-qualified for the local market demands and with no clients. 7Cai was the place I went to in order to recharge my batteries. 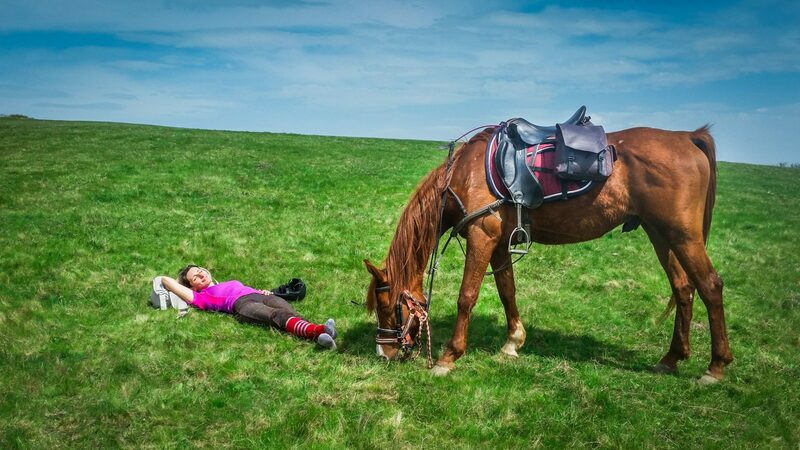 Just by being among Dan’s 40 horses, who run free on the hill behind his ranch, relaxed me. The horses were sending me the energy I was unconsciously absorbing. They were like a drug I needed to keep on fighting. I March 2016, on my birthday, I decided. Against all logic and listening only to my instinct, I would rent Petru. To be only mine. He was as restless as ever. I didn’t even think of riding him during the first month. We only became friends. I weaved him, combed him, rewarded him with carrots. He ended up following me like a dog. 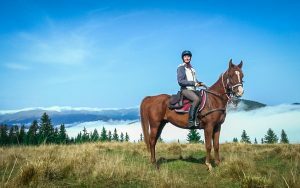 I was dead scared when I saddled him, to leave for the mountains. I was expecting him to jump like a goat and throw me down. Surprise. He was perfect. Calm and relaxed as if we had been walking together for years. 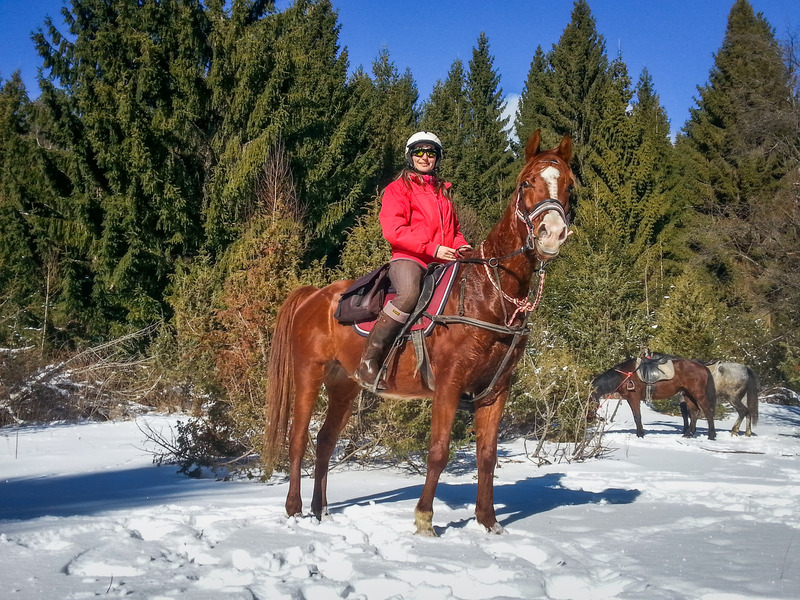 “Look, Petru has finally settled down,” a rider at the farm said laughing when seeing us. That’s how our story began. We needed each other without knowing it. Only Dan had seen it. I had to overcome c ertain mental obstacles and he desperately needed affection. 7Cai is the place where you confront your fears, that forces you to talk to yourself. It’s a tougher place that you either love or hate. It’s a place that gives you the freedom and authenticity you don’t want to quit anymore. I’ve learned to lead Petru only by whispers. I know when he’s tired and or when he simple wants to be spoiled and chew some leaves. He understands m y need for safety and allows me to lead him as softly as an artist playing the piano. I know he hates running downhill and let me at his pace. 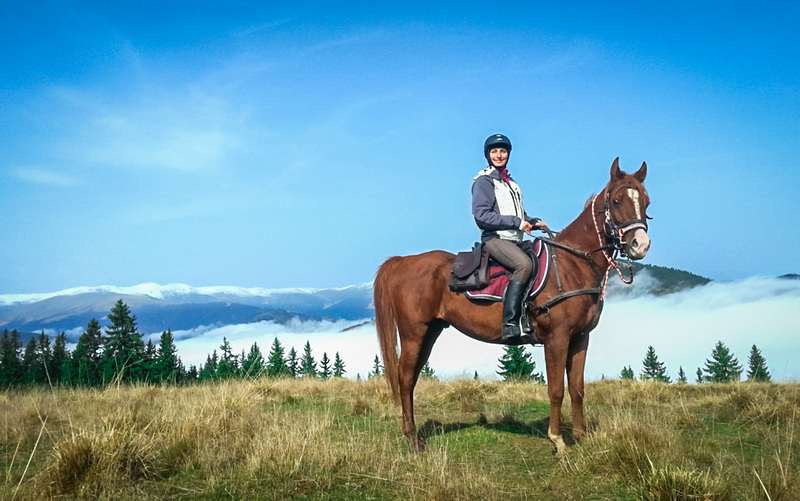 We leave in the mountains alone or with other horses. We run at full speed or slowly, as we want. We always go in our own rhythm, no matter what the other horses are doing. I keep spoiling him with carrots. I weave and comb him, to make his hair shine. I learned to ride without knowing it. We run over hills and plains. 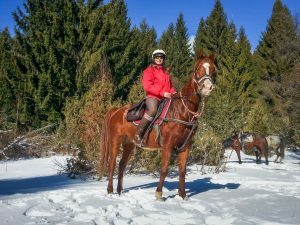 In a few months I will buy him and in the summer I plan to take part in our first endurance competition. Turning point. I can’t thank him enough for his support and for telling me this. That was it. I knew exactly what I had to do. To apply everything I knew about artistic photography, about lights, shadows and post-processing to emphasize the traits and feelings of the animals I instinctively understood. The plan of attack came by itself. To offer equine photography workshops to horse and photo lovers. To talk to horse owners and take artistic photos of their animals. And to sell paintings to horse lovers. Did it work? Yes. I travel, teach, take photos and edit. When I get tired, I go to Petru. I saddle him and leave for the mountains. To recharge my batteries.